Henry Segerman is well-known for the intricate mathematical modeling that he designs and prints at his Shapeways shop. So to put our Replicator 2 to the test, today we printed henryseg's Stereographic projection model from Thingiverse. It came out beautifully! Settings: Printed with some looping on a Replicator 2 with MakerWare .3mm/low (the red one) but very nicely on MakerWare .15mm/high (the purple one). Raft used but no supports. My favorite thing about Segerman's model it is that it really makes clear where the north pole gets mapped under steregraphic projection. Can you see it? 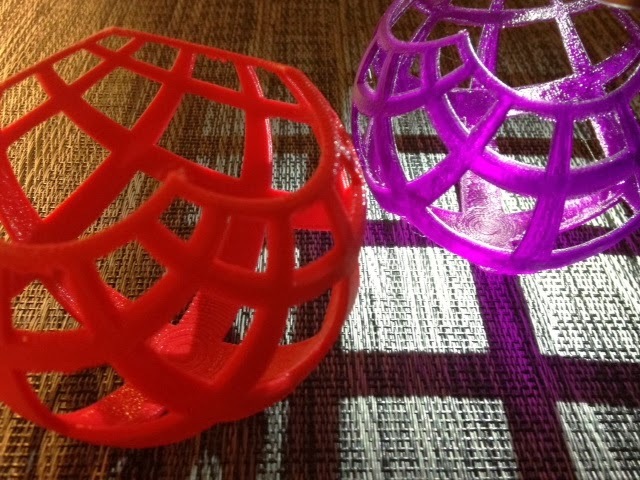 UPDATE: This post caught the eye of evelynjlamb at the American Mathematical Society's Blog on Math Blogs, and subsequently this MakerHome blog was featured there in the post The Revolution will be 3D Printed!